House for sale in Oroklini - mature garden. This 2 bedroom house is in a great position in the village, right at the back, nestled in the crook of the hill, amongst the original residential area of Oroklini, not overlooked and with a secluded and mature garden, convenient for shops and the village etc. There are 2 double bedrooms, one on the ground floor and with the other accessed by a separate staircase with a view of the sea. There is an open plan kitchen / living area, which then passes into a washing/ vanity area with a shower and toilet in a separate room to the right. After this is a double bedroom with a separate entrance directly to a covered patio area. There is a large built in wardrobe in the downstairs bedroom. 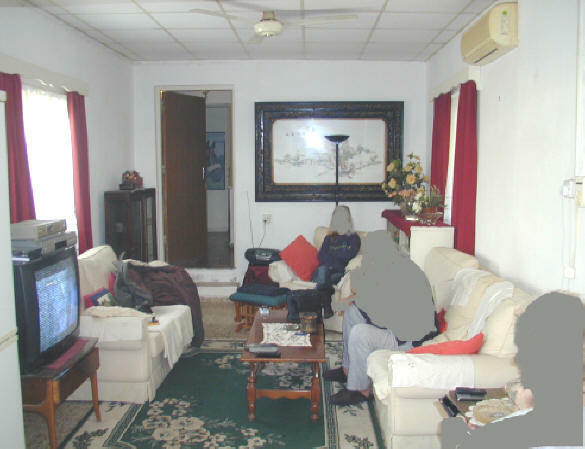 The bedroom and living room are both air conditioned. There is a raised concrete platform at the bottom of the garden which would take a wooden or prefabricated structure giving you at least another 2 bedrooms and bathroom or living area /studio with minimum expense and effort. There are well established trees in the garden including grapefruit, pomegranate, fig, bougainvillea and other exotic shrubs. There is an outside toilet and small storeroom under the stairs, The garden is walled, there is a driveway accessed by double gates which could be used to park 2 or 3 cars inside your boundaries. The water has both solar powered heating and a standard immersion heater for a top up blast in the winter. All services are connected (electricity, mains water and telephone) and the house also has a satellite dish and box which can be passed to the new owner. This is an ideal retirement home for an active couple who would like a garden in a convenient yet secluded place either for animals (pets) or a swimming pool would fit nicely. The separate bedroom upstairs makes it ideal for visiting family members too. It is 15 minutes from Larnaca international airport, has a motorway at the other end of the village giving quick access to Nicosia, Ayia Napa, Limassol and all other parts of Cyprus. The village itself is popular and growing village, still retaining the original character in this part of the village but with all the amenities you would expect from a new residential centre. The beach is 5 minutes by car and the main shopping of Larnaca is only 15 minutes away. There is a certain amount of furniture which can be bought with the house including 3 piece suite, fridge, washing machine, cooker, microwave etc. The plot itself is in the zoning for 120% building, and so a 3 storey block could be built there if required. Clear and available title deeds.